When I build my groovy prefab dream house, I'm having Little Sheep's giant photomural of a Mongolian yurt as the living room wall. Then, perhaps in other rooms, I'll recreate both Canter's photo ceiling and Chameau's camel eyelash ceiling. Anyway, I digress. Little Sheep (sometimes known as Little Fat Sheep, depending what menu you look at), is a dizzying amalgam of 21st century cutesy Asian branding (Hello Kitty-style sheep on the server's shirts which read "Got sheep? ", a bright coffee shop-like interior with the cool murals) and an almost Jurassic style of cooking. The specialty is hotpots, and I'm not even sure if you can order other things without also committing to a massive, roiling pot of milky broth on the heating ring in the middle of the table. You can get your broth mild or spicy or half and half. We went for half and half, which looked nice but I find that although I can down an entire plate of fiery chicken Szechuan cubes or Thai curry, searingly hot clear soup is a little harder to deal with. In the broth float all manner of objects -- galangal root, ginger slices, cardamom pods, mysterious walnut-sized spices, jujubes and dragon berries. The broth soaks up some flavor from all this stuff, but the idea is to customize it with the right mix of some two dozen add-ins from the meat, vegetable, tofu and noodles columns on the menu. We chose sliced lamb, maitake mushrooms, bean thread noodles and pea shoots but realized later that shitake mushrooms and bok choy would have worked out better. Throw in some cilantro to boost the flavor. 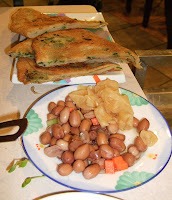 Scallion pancakes (left, with free peanut and daikon appetizer) are fun to dip in the broth; if the steam from the soup proves overwhelming and you weren't thinking of having a Chinese herb facial right then, you can turn off the burner for a while. Lamb dumplings were a little too lamby for me, but nice when submerged in the broth. You have to try this place at least once for the experience and to soak up some medicinal hotpot; if you're a lamb lover or want to refine your soup ingredients combo, you'll be back for seconds. There's also beer, fruity drinks, and side dishes like lamb fried rice or lamb noodles. In case you need some more lamb. And I have to give them a huge shoutout of thanks -- I left my camera there when it slipped out of my purse and they found it and saved it for me -- M goi! clarification on the "little sheep" vs. "little fat sheep" issue... i believe that they are 2 separate places. maybe i'm wrong... could someone confirm which is which? Excellent. The broth was fantastic. We over ordered the meat and vegetables because we were unsure of the portion size. This place makes Japanese Shabu Shabu shabby. it's only slightly different. 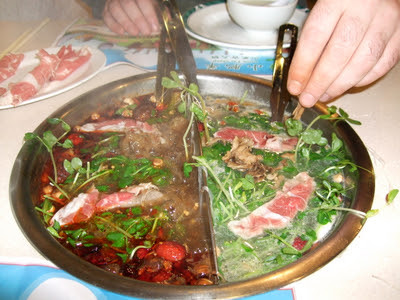 In that in this Mongolian/Chinese version, there is so much "stuff" you throw in there all at once, you cannot scoop out the meat's "crud" as the crud floats to the surface, as you would in Japanese style. Japanese style is cleaner, leaner, may be lighter on the taste, and gentler on the stomach. Delicate, even. It's not shabby. You just don't go throwing everything in there.